Why Do I Need to Floss My Restorations? If your smile has suffered damage, restorations rebuild and restore your oral health. Among the biggest threat to their long-term success involves bacteria. Your mouth naturally contains bacteria—some that are good and some harmful. If the bad bacteria are not removed from even the smallest of crevasses in your mouth, like around a crown or a dental implant, it can lead to infection and decay. On average, a dental crown needs to be replaced about every 10 years, but it is not uncommon for them to last much longer. Flossing can promote how long they last. While you may think brushing is enough, the bristles cannot remove bacteria from where the crown meets your gumline. If it is not removed with daily flossing, it can cause the tooth under the crown to decay or an infection to develop. When missing teeth, a dental bridge it the most convenient solution to fill the gap. It involves holding a bridge of prosthetic teeth in place using dental crowns on the adjacent teeth. Not only can bacteria become trapped near the crowns, but under the bridge as well. Flossing prevents an infection of the gum tissue while also keeping the crowned teeth healthy. With the right care, your bridge can last an average of 5 years before needing to be replaced. Now, many people have come to prefer dental implants in Daytona Beach to replace their missing teeth. They have the potential to last for a lifetime if your smile remains infection-free. To remove harmful bacteria, take the time to clean about the abutments and the implant posts every day. It is recommended you use a high-quality dental floss that has earned the American Dental Association’s Seal of Acceptance. 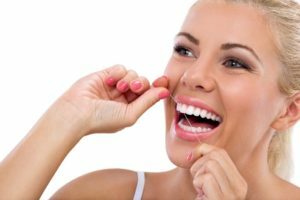 As an alternative to traditional floss, you may find a water flosser to be easier to clean tight places, like around implant posts. With the right aftercare, you can ensure your restorations last to keep your smile healthy. If you have any questions about caring for your crown, bridge, or dental implant, do not hesitate to call your dentist in Daytona Beach. Dr. Gladston Silva strives to enhance his patients’ lives through improved dental health. Besides preventive care, he also offers restorative services. If you have damaged or missing teeth, he has the solutions you need for a healthy, functional smile. Contact Lakeside Daytona Dentist today to schedule a consultation.